Our painted cabinets are made using a single piece construction. Rather than a frame and panel, the door is made from a solid wood slab. A router is then used to carve the design into the door front.This design gives the doors a seamless and striking appearance. Because there is no frame and no joined corners, these doors are not susceptible to the cracking and chipping of paint that is consistently found wherever the pieces of the frame meet on 5 piece doors. Our single piece solid doors are available on White Shaker, Grey Shaker, and Antique White cabinets. Our Espresso Shaker, Mahogany Shaker and American Walnut doors are made with a five piece frame and panel construction. Four frame pieces around one pre-finished hardwood. 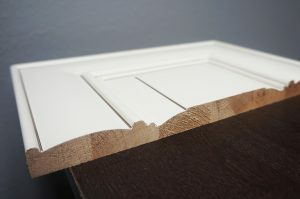 Unlike other regular 5 piece doors, we use rubber strip technology to hold the center panel in place. This allows space for the center panel to shift during natural wood expansion just like in normal 5 piece doors. 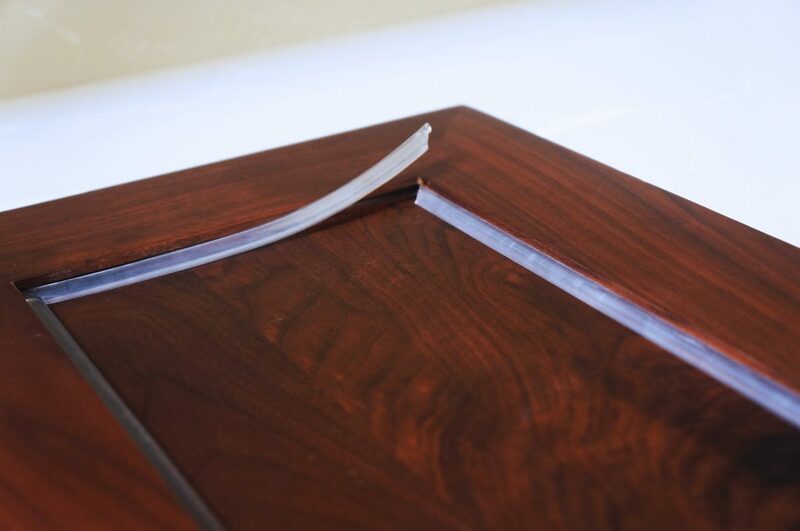 Furthermore, our rubber strip technology allows us to stain and finish the panel before installing it in the frame so you will never see any unfinished edges. 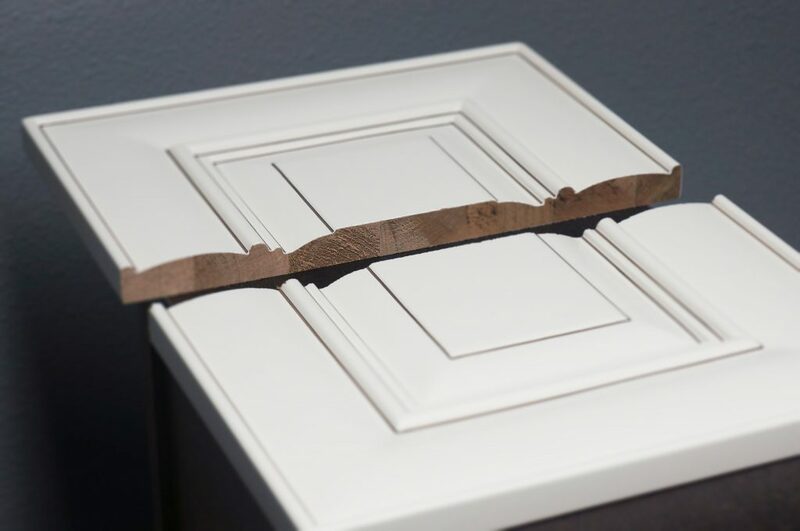 This rubber strip technology also gives you the option of flipping the center panel around to give the door a raised wainscot design or remove the center panel in favor of glass. Our European cabinets have very different doors. 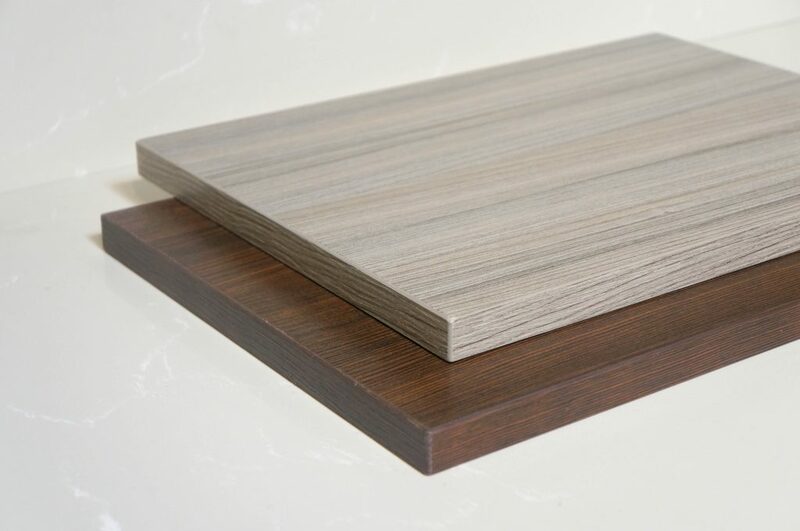 Two of our styles are MDF covered in a textured melamine. This textured melamine gives the texture and appearance of wood grains and it covers all six sides of each door. 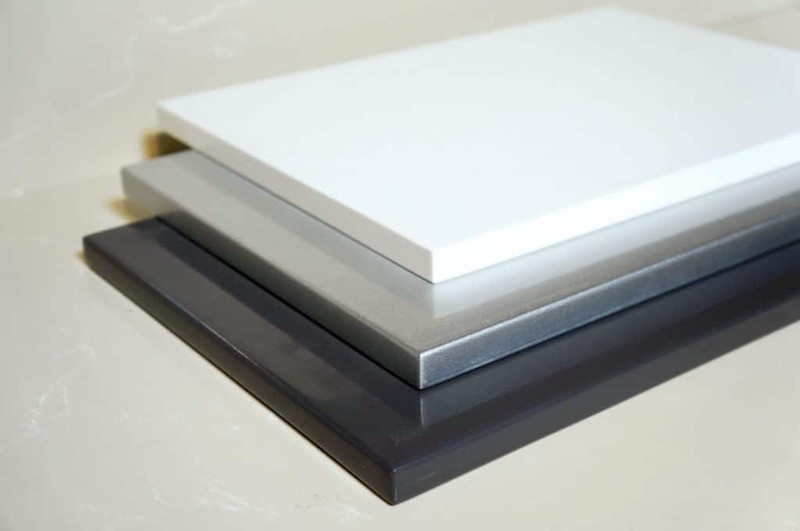 You do not need to worry about this surface peeling off over time because the melamine is a form of high-quality plastic similar to what is used for laminated coating. This makes it much stronger and more durable than cheap surfaces found on Thermofoil doors. Textured Melamine doors are available on our Cocoa Flat and Milan Flat cabinets. Our other European cabinets have a thick lacquer finish that we call “High Gloss”. These impressive looking doors each have an incredibly smooth finish layered on top of 3/4 inch MDF flat panels to prevent the serious warping and paint cracking that often occurs to natural wood doors with this kind of finish. High Gloss Doors are available on our High Gloss White, Silver and Charcoal cabinets.